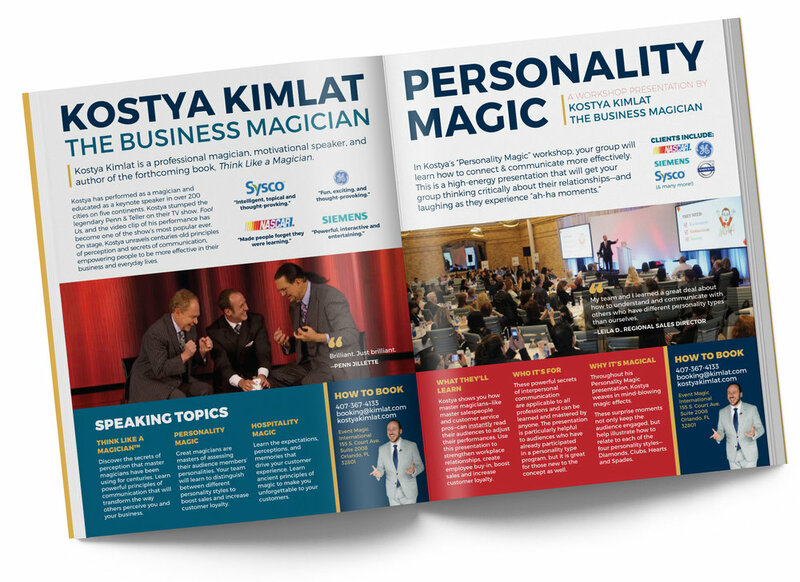 Kostya is a fun motivational speaker—combining his insights as a magician with a business message. Choose from 3 keynote speaking topics or workshops: Think Like A Magician™, Personality Magic, and Hospitality Magic. In his signature keynote speech, Kostya shows you that magic is not about deception— it’s about perception. At business meetings, conferences and conventions, Kostya talks about the role that perception plays within business and most importantly, the customer's mind. You’ll learn secrets that master magicians have been using for centuries to connect with their audiences and influence how they see, think and act. Kostya will show you practical ways to apply these powerful principles to transform the role that perception plays in your life and business. Kostya shares these secrets with executives, managers and employees, giving them specific ideas, tools and strategies to improve their business. Think Like A Magician™ is perfect for a company, association, or group of clients who could benefit from viewing their job, their actions, and their interactions with others from a new perspective. It’s appropriate for professionals at all stages of their careers—from front-line staff all the way to the CEO. Throughout his keynote presentation, Kostya weaves in mind-blowing magic effects. His message comes alive through the art of interactive magic, which sprinkled through his talk, keeps audiences on their toes and entertained. But it is the message, not the magic, that makes the greatest impact. You won't learn how to cut a girl in half or make someone levitate. Instead you'll learn the real secrets that make magicians the ultimate masters of perception. In addition, this 60-minute signature keynote can be paired with interactive magic entertainment at a pre-session event, as well as up to one hour of a meet-and-greet at a post-session event. Get Kostya’s speaking materials in PDF form, so you can print and share with your colleagues. Thank you for requesting a copy of Kostya Kimlat's Speaking Kit! Enjoy your magical read. In Kostya’s “Personality Magic” workshop, your group will learn how to connect & communicate more effectively. Kostya shows you how master magicians—like master salespeople and customer service pros—can instantly read their audiences to adjust their performances. Use this presentation to strengthen workplace relationships, create employee buy-in, boost sales and increase customer loyalty. These powerful secrets of interpersonal communication are applicable to all professions and can be learned and mastered by anyone. The presentation is particularly helpful to audiences who have already participated in a personality type program, but it is great for those new to the concept as well. Kostya's writing on personality styles has been published in more than a dozen publications, including ADVISOR Magazine, Networking Times and Personal Excellence. Throughout his Personality Magic presentation, Kostya weaves in mind-blowing magic effects. These surprise moments not only keep the audience engaged, but help illustrate how to relate to each of the four personality styles—Diamonds, Clubs, Hearts and Spades. What’s Kostya's secret to making content memorable? In Kostya’s “Hospitality Magic” presentation, participants will learn how expectations, perceptions, and memories shape the customer service experience. Be guided by a master magician as you explore the fine art of customer astonishment. Discover how to create unforgettable experiences for your customers and create moments of “Hospitality Magic” that become the legends that brands are made of. Learn to “wow” customers and clients using the same principles magicians use to “wow” their spectators. Ideal for customer service, front-line employees and management, this presentation takes a hands-on look at creating an experience worth talking about. This keynote is especially useful for companies and associations which serve customers in a hospitality environment. Throughout his keynote presentation, Kostya weaves in mind-blowing magic effects. In addition, this 60-minute signature keynote can be paired with interactive magic entertainment at a pre-session event, as well as up to one hour of a meet-and-greet at a post-session event.